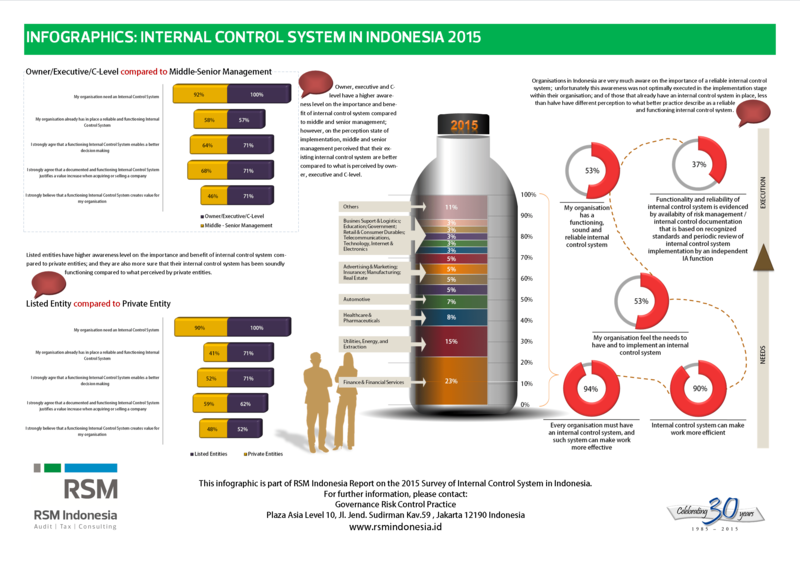 The Internal Control Survey Report is a helpful information for organisations in Indonesia to compared on what others are perceiving and implementing in their organisation, with regards to an internal control system. Owner, Executive and C-Level have more awareness on the Benefit of Internal Control System Compared To Middle and Senior Management Owner, executive and C-level have a higher awareness level on the importance and benefit of internal control system compared to middle and senior management; however, on the perception state of implementation, middle and senior management perceived that their existing internal control system are better compared to what is perceived by owner, executive and C-level. Listed Entities are More Aware on the Importance and Benefit of Internal Control System Compared To Private Entities Listed entities have higher awareness level on the importance and benefit of internal control system compared to private entities; and they are also more sure that their internal control system has been soundly functioning compared to what perceived by private entities. High Awareness but Lack of Priority. Organisations in Indonesia are very much aware on the importance of a reliable internal control system; unfortunately this awareness was not optimally executed in the implementation stage within their organisation; and of those that already have an internal control system in place, less than half have different perception to what better practice describe as a reliable and functioning internal control system. Download infographics and full report to read more.